I am in awe of the garden at the moment. 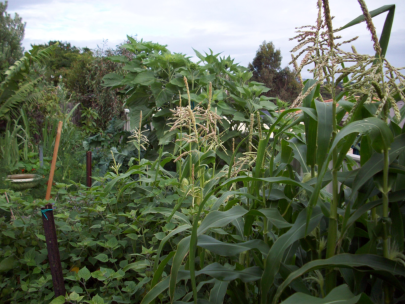 The weather has been favorable for the majority of the garden, though not so much for farmers wanting to harvest. The combination of rain and sunshine with humidity has meant that the fruits forming in the garden are doing really well. We were fortunate enough to get a reasonable harvest from our apricot tree with the New Holland Honeyeaters and Silvereyes sharing some as well. Not so much of a drama for us with one tree to keep an eye on. The corn is doing well also. This one is a hybrid from Diggers. I have enjoyed growing it and will be looking for some heirloom varieties I think. The guinea pigs are quite happy with the occasional leaf of corn. With the warmer weather the babaco has been in full swing, ripening up a little each day. Nearly there. Another pleasant surprise in the garden has been the beans and the cucumber. 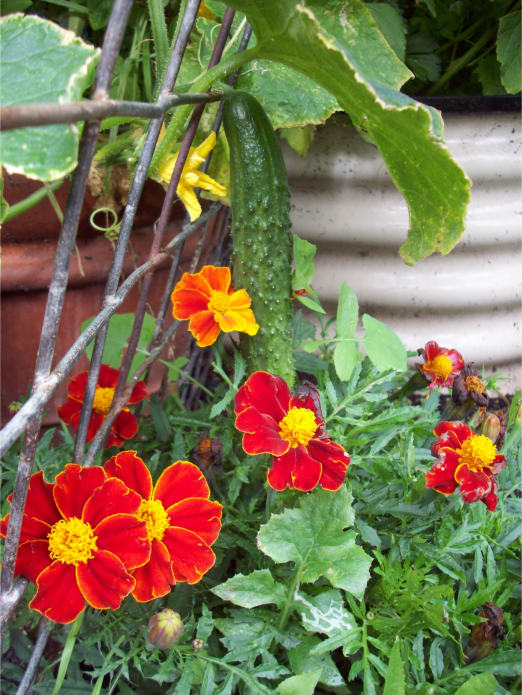 I had moderate success with gherkins and cucumbers last year so put in a little more effort this year as I really do like them. 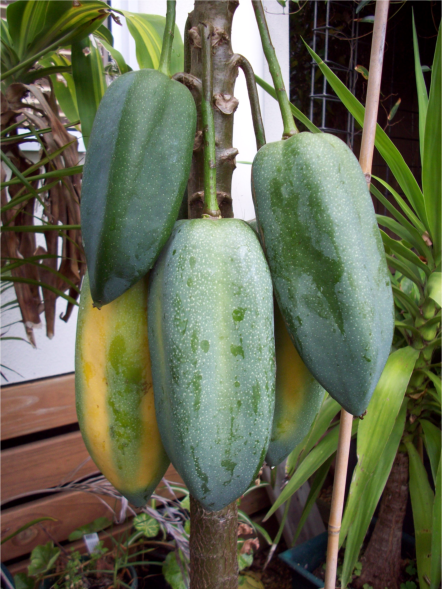 In the back garden just near the corn is a melon that has self-sown and is forming a fruit – rather quickly too I might add. 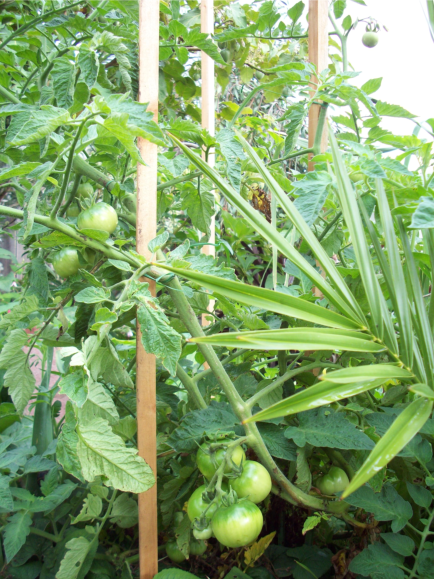 Other self-sown plants are tomatoes and a pumpkin which is really starting to spread out into the garden. 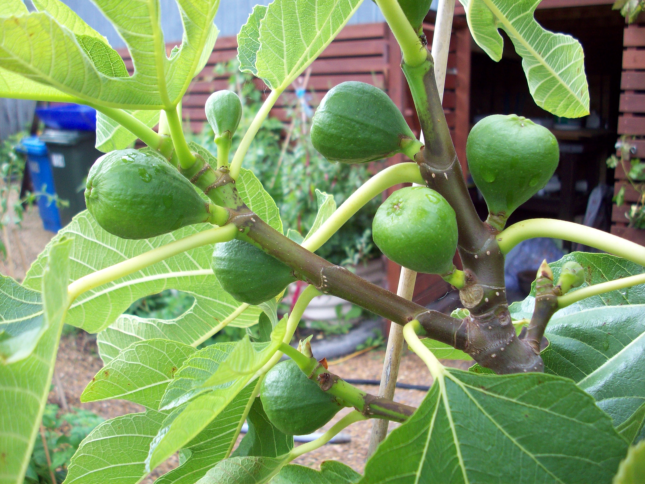 The fig is doing well. 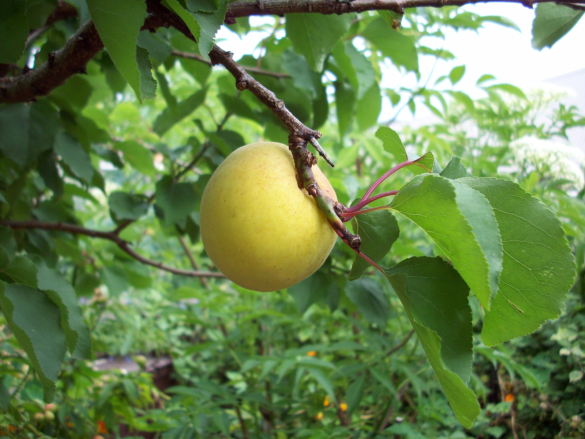 On some stems there are small fruit starting to form now, even though the tree is already in the midst of a reasonable crop. Not sure if these new ones will be retained by the tree or not but it is getting regular water and talking to. 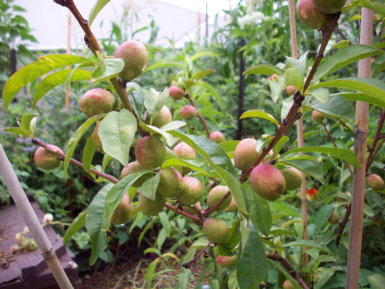 Our nectarine tree is also doing us proud this season with a good crop forming. Very slow to fill out but I am not wanting to give it too much water with the rain we’ve had. I do need to watch it though, because being in a wine barrel it can dry out even in moist weather. This afternoon I picked our first ripe tomato for the season. It was found hiding behind this bush which came up during the winter and has managed to survive given the mild winter and the shelter is has received from the nearby plants surrounding the pond. A very, very firm fruit despite it being a nice ripe colour which leads me to think it was simply because it was straight off the plant. Other observations to note are that the yacon are doing really well with the humidity are have good leave growth. These have probably been in the ground about a month and a half now. I have not put a picture of the passionfruit vine but it too is covered in a good solid crop and still continues to flower. The sweet peas are also still flowering well and most of the very first flowers for the season have produced near-dry pods ready for picking. Oh, and the raspberries! A handful every few days to feed the wife and keep her happy.